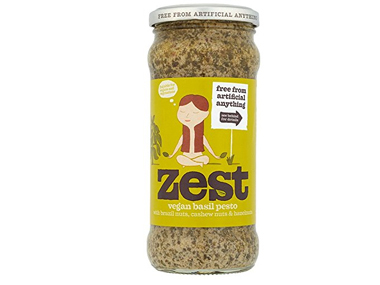 Buy Zest Vegan Basil Pesto - 340g in the UK from our online shop or directly from our independent Scottish store. This vegan Pesto is made only from the leaf of the basil plant and without cheese or any other animal products. Italian-style basil pesto with brazil nuts, cashew nuts and hazelnuts. Vegan pesto, so free from cheese and dairy. Ideal to liven up all kinds of foods. We sell real Zest and other Table Sauces directly from our shop in Scotland and online throughout the UK. View more products from Zest. Where can you buy real Vegan Pesto - 340g safely online? If you are wondering where you can buy Zest Vegan Basil Pesto - 340g safely online in the UK, then shop with us. We are an actual health foods shop; with real people selling real foods and products. Our award-winning independent shop is located in Stirling, Scotland since 1976. You can buy our Table Sauces in store or safely place an order with us online or over the phone. Vegan Pesto - 340g - Zest Vegan Basil Pesto - 340g in Table Sauces and Table Sauces & Condiments.